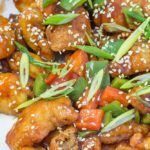 Our Keto Sweet and Sour Pork Recipe is almost a dream come true! From the tender battered pork to the sticky red sauce, you won’t believe it’s all low carb! Heat your deep fryer oil to 180C/355F. In a small bowl, add the almond flour, protein powder, baking powder, and salt. Whisk together. Add the egg and sparkling water and whisk until a thick batter is formed. Dip the pork strips into the batter then gently drop into the hot oil. You will need to cook the pork in batches to prevent the deep fry from becoming overcrowded. As the pork is cooking, use a metal spoon or tongs to gently flip the pieces over. Cook until lightly browned then set on absorbent paper to drain, the batter will still be a little soft at this stage. In a large non-stick frying pan, add the oil and saute the onion and pepper over high heat for 5-8 minutes. Drop the heat to low and add the Keto Sweet and Sour Sauce, and heat until warmed through. Deep fry the pork strips and a second time, until golden brown, then drain well. Place the crispy pork strips into the frying pan with the sauce and toss together. Sprinkle over the scallions and sesame seeds and serve immediately. We recommend serving with a side of Cauliflower Rice.